As the premier annual event in the radiology field, RSNA 2019 represents a big opportunity. It’s a flurry of activity packed into a single week. With a large, diverse audience and the chance for exposure to 25,000 professionals from 115 countries, it’s wise to start thinking about your trade show and marketing plan. And as you think about it, consider holograms. By its very nature, the exhibits industry is compelled to innovate. The cutting-edge steals the spotlight in trade show environments. Event marketers and exhibitors aim to increase engagement, capture attention, and generate buzz around products, services, and, in many cases, the equipment itself. While your exhibit’s floor plan may be spacious and large, there are times when large equipment — be it scanners, ultrasound machines, or a Plane — the equipment may be simply too large or too cumbersome to display. In those instances, what better way is there to enhance a sophisticated, eye-catching display than with a Hologram Display Showcase? The 3-D holographic display allows you to combine a physical product with 3-D holographic content. The result is stunning. Instead of merely utilizing a product sample or static model, the hologram display delivers 360 degrees of visual context with remarkable accuracy. With dynamic holographic 3-D displays, the technology overcomes context issues for prohibitively large goods (such as that BOP) or complex services. Single-dimension CAD rendering may provide a representative feel but offers less dimension and may feel a little flat. While a model provides perspective, it lacks motion. 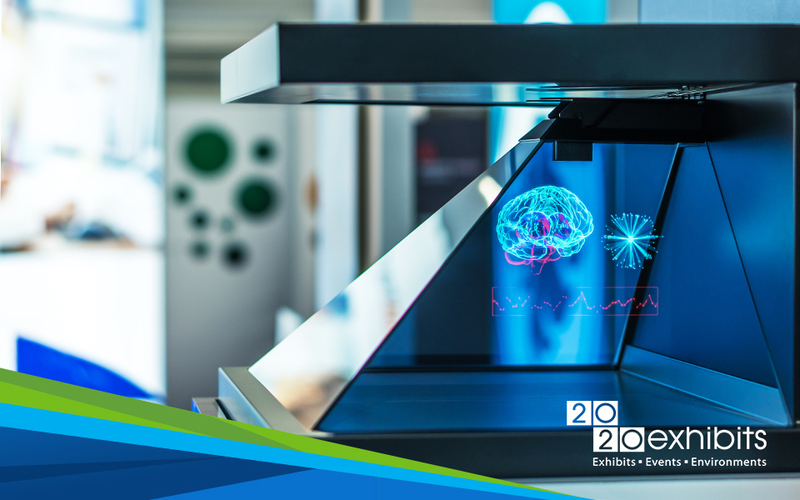 The 2020 Exhibits hologram display showcase marries context with motion and delivers a product display that is a perfect solution for large-scale demonstrations. The display fits ideally into any exhibit space as its multi-sided viewing perimeter is perfectly suited for large groups. The high-resolution output and bright picture quality allows detail to be seen from long distances and built in loud speakers allow robust sound to accent the display and help define the 3-D motion.